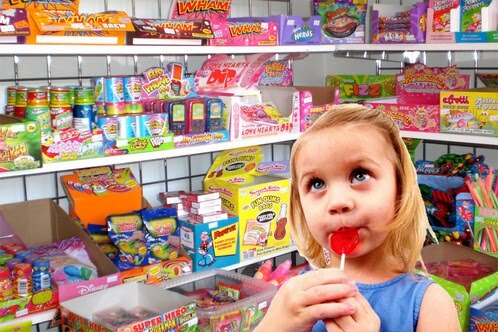 Weighty Matters: Did you hear the one about kids who eat candy being thinner? Did you hear the one about kids who eat candy being thinner? I heard about it when Linda Bacon from HAES tweeted a link to a press release about it multiple times, calling it "Myth Busting". Knowing that Linda knows how to critically appraise a journal article, I figured it'd be worth reading the actual study. The study looked at one solitary day's 24hr. dietary recall collected from 11,182 children between the ages of 2-18 years of age, and then compared candy intake to overweight and obesity status in those same children. Now dietary recall is known to be fraught with error, especially when it comes to less than healthy foods. So is there evidence of error here? Well according to their results, only 30% of children have candy on a daily basis, where candy means a sugar candy or chocolate (more on that in a bit). That sure sounds like an awfully small number. And of the kids who actually admitted eating candy, how much were they found to be eating? One chocolate bar worth for teens aged 14-18 and about 2/3 of a chocolate bar worth for kids aged 2-13. That sounds like an awfully small number too. Now maybe kids really don't eat candy any more. Maybe the world's changed more than I've envisioned and only 3 out of 10 children eat candy daily, and do so in rather tempered amounts. And maybe candy's not only not bad for you, but it's good for you, specifically good for you in regard to weight in that this study found that the kids who reported eating candy, were 22 to 26 percent less likely to have overweight or obesity! Of course the other possibility is that it's just an awful study that doesn't fairly lend itself to any conclusion whatsoever (pro or con). And while we're at the awful study angle, given that this is a study where the authors' conclusion and the public relations spin is that candy's not bad for you, and apparently is protective against overweight and obesity, I think it's probably also worth asking what wasn't counted as candy? Cookies, freezies, ice-cream, pudding, fruit roll ups, cake, pie, etc. Just chocolate candy and sugar candy. So what else wouldn't fit? Any other junk food - chips, pretzels etc. The only conclusion I'm able to fairly draw from this study is that those of us who have any degree of Twitter influence, we really have to hold ourselves to a higher standard of retweeting. It's always tempting to retweet a press release or a blog post about a study that fits within our own confirmation biases, but before we do, we should really feel obligated to first read the actual study and evaluate it just as critically as we would those studies that don't fit neatly within our personal narratives.